Ever wonder what true darkness is? You know, where there’s so little light that your eyes have difficulty defining objects … like when you hold your hand in front of your face and you can’t see it. Yes, that kind of dark. It’s interesting to experience for a few minutes, that feeling of being able to see absolutely … nothing. Imagine standing deep in the mountains, where there is just … well … nothing but black. Wait to be embraced by the night, and then peer into the depth of it. That’s it! Nothing at all visible, and you feel absolutely lost in the dark. Even the dim light from the stars provides no way to measure surroundings. No way to find a landmark, a sign, nothing to guide your way. True darkness. Now, imagine a life where most evenings look like that after the sun goes down. Consider a life where you’re far removed from easy access to, say, a light switch providing the warm glow from a chandelier, or the lamp on your nightstand, or even streetlights. No ambient light at all. Think about living somewhere with absolutely no electricity, where everything thing you do is dependent on sunlight. The sun goes down and your day ends. Welcome to life in La Cayetena, Honduras. It’s what they experience with every nightfall. Join me for a few minutes and hear how TerraMica is making a difference in that reality by bringing a little light to families in this remote community. 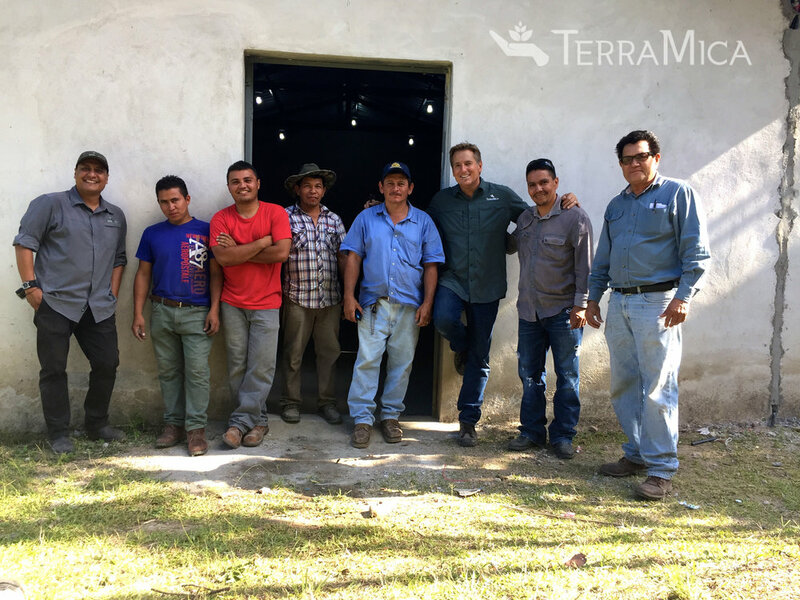 TerraMica and the La Cayetana church electricity project - two of our staffers with some of the local men who participated in the project. Nestled in the mountains nearly 4,200 feet above sea level, this tiny hamlet is made up of twenty-three families averaging six members, most often with three generations per household. They farm crops such as coffee, corn, and beans to sustain themselves, and when surplus crops are transported to sell at market, they are packed on the back of a mule. This mountain community has one building that serves both as their church and as their community center. Farming families have been gathering together for countless years to discuss village issues as well as to worship collectively, always in a building having no lights. By the time the sun has set and darkness falls upon the one room building, families must walk home in absolute darkness, or their gatherings must end an hour prior to sunset so their paths home are lit by the waning sunlight. Traveling mountain pathways in the blackness of night is dangerous, yet meetings held during the precious daylight can be impractical. Farms must be tended for the sake of survival: planting, weeding, hauling water, pruning, harvesting all require daylight. Still, community worship, teaching, and village meetings are crucial in the lives of these families. It is their connection to their neighbors, their friends, their community, and their God. This is all so critical in an isolated village such as La Cayetana. Can you imagine living your life with the sun as your only light? Neither can we. 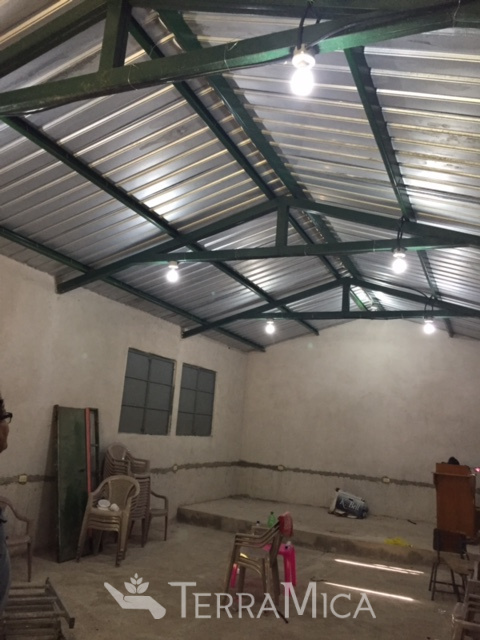 So when TerraMica was invited to partner with a Honduras coffee cooperative, CDR, in bringing electricity to this church building and community, we were excited to participate. TerraMica provided the necessary supplies, gathered a team, and set off to accomplish the task at hand. A little sweat, a little laughter, a lot of work … and electricity arrives! Beginning in August, these families no longer have to be home before the sun disappears behind the mountains. The people of La Cayetana can now gather together well into the evening, enjoying the warmth of newly installed lighting throughout the building and surrounding outside area, providing safety and a new sense of community value. Do you see it? People gathered in the warm glow of light, laughing, singing, studying, and talking far into the evening. Now the absolute darkness of this mountain community is warmed by light long into the evening. It is through simple acts like these that TerraMica cares for people and their needs … one person at a time, one family at a time, and one village at a time.